Are you leaving your old town and moving to a new place? Have you planned for everything? Leaving your old house and moving to a new place can get messy. This can even be draining both physically and mentally. This makes the experience both exciting and painful at the same time, especially when people tend to forget the necessary things to do in order to avoid chaos. Plan ahead of time. 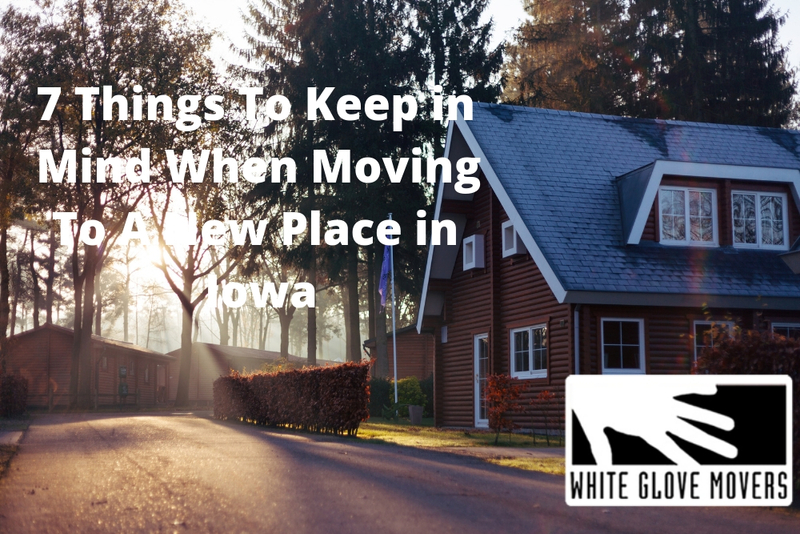 Keep in mind these 7 things when you’re moving to a new place in Iowa. Moving out to a new place needs a lot of planning. List down your itinerary. Estimate the time you need to accomplish tasks. Plan ahead and don’t be a deadline artist. Last minute packing can give you crams and might end up forgetting an important thing with such hurry. Thus, creating a checklist will give you peace of mind. Most of the time, you tend to bring all of your old things to your new place. Little do you know that this is a perfect opportunity for you to throw away or sell (for extra money) your old unusable furniture. Transporting too much furniture can cost you time and money. So sell your not so useful things. In this manner, you have not only eliminated your clutters but you have also earned money at the same time. Moving to your new place gives you the chance to redecorate. Design it better than what you had before. Buy new furniture that will fit your place. It will definitely transform it into a new place with a new perspective! When moving to a new place, you’ll need help with transportation. If you’re moving a lot of luggage, especially the heavy ones, it is best for you to hire professional movers. A professional moving company in Iowa can help you move faster and smoother. But do not just wait for the movers to come in, make sure to yourself that you got everything on your boxes. Get your things ready beforehand to avoid wasting time and effort. All of these has to be properly packed for it to safely transferred. You can also use clothes to wrap fragile things to protect them better and reduce your cost in boxes. These things should be pack in one place to prevent misplacing them. Pack these things first, but do not put them first on your packages. Rather make these the last items to enter your moving truck. As much as possible, keep it near you in case you need them. Write description labels on your boxes to easily identify the content inside. It will be easy for you to look for your things especially when it’s unpacking time. Unpacking can take up several days, and with the labels, you don’t have to search every box to look for things you need. It will save you time, money, and effort in the end. You might have friends or family in the new city you’re moving in, you can contact them and tell them when you’re arriving. They can help you in moving to your new place. They can even help you familiarized the surrounding. Just be sure to reward them! May you enjoy your new place!! !